When John Monday go on stage there's no going back! Just let go and forget everything for one night. Music full of life and energetic power. "New Age Rock'n'Roll" describes this exceptional state, and stands for the subconscious roots of a generation of musicians in the traditional sense of Rock'n'Roll. Established in 2013 doesn't mean new-modern thoughtless ideas, but classically timeless. If Quentin Tarantino had younger brothers then it would be the 23 year old John Monday. They present themselves in 70's gear with 4-part harmony voices. With Nikita Grabin on the Gibson and Adrian Boog on the Sandberg they sing with their complementing voices in 2-part harmony. The songs are full of attitude and irresistible authenticity. An explosion of colour that can only be produced by the the style and influence of Ole Müller on Fender,and Dominic Harrison on his Gretsch/Ludwig who brings his full spectrum of playing to the fore. 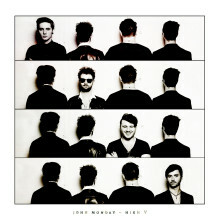 High V is their EP released on July 17th 2015.